Adams, WI: The Lucky Wolves have served their community once again. 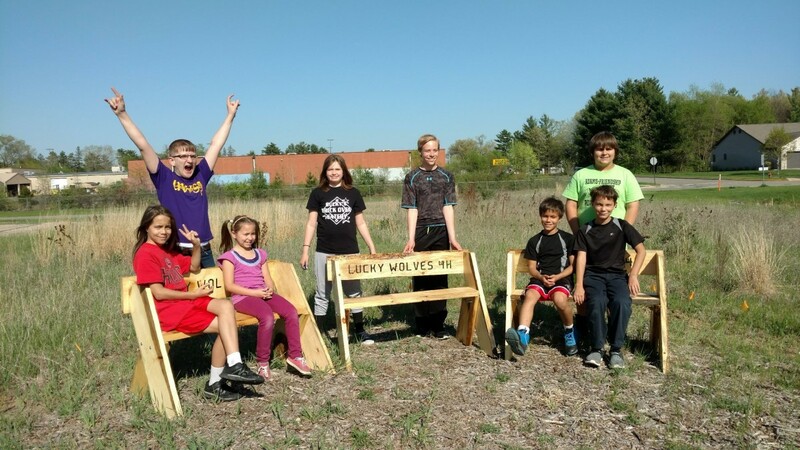 On Wed., May 16, members of the Lucky Wolves 4-H Club put the finishing touches on the benches they built for the Butterfly Garden at the Adams County Community Center. Starting with wood harvested from land owned by club leader Helen Casper, the boards were cut to size, engraved, and sealed by Casper with help from parent Rose Whyte. Casper and Whyte supervised the assembly of the benches by members of the Lucky Wolves at the Community Center on Wednesday, May 16, with help from parent Angela Gatrel. The Lucky Wolves hope everyone will enjoy the benches. The Butterfly Garden is just south of the Community Center parking lot. It’s a great place to watch for butterflies. The Library plans to use the area for outdoor programs. The Butterfly Garden has been a project of the Adams County Library since 2015. They are currently removing invasive plants, and tending the native species that provide shelter or food for butterflies, bees, and other creatures. They are always looking for people interested in volunteering. The Lucky Wolves 4-H members in the photograph below are: (l to r, back row) Peter Cohen, Oceana Garcia, Conor Casper, and Logan Gillespie; (l to r, front row) Draven Hudson-Morales, Atira Hudson, Tharron Morales, and Torin Morales.